Warmest wishes for a joyful Christmas and meaningful abundance throughout the holiday season. Oh I love holiday breakfasts. No one is in a hurry to get things on the table, no one is in a rush to finish, and there is time for another cup of coffee, and may be another. Holiday breakfasts are for lingering. Is that the pace at your house over the holidays? I suspect for most the joy in lingering is all about timing. There are things that need doing first thing in the morning before you can really enjoy a long sit down. I have friends who, as children, on Christmas morning had to eat a full breakfast before even so much as getting a peek at the tree in the living room. In our house growing up we had to wait for my eldest sister – the family sleepy head – to wake before we could all line up and file down the stairs. Now with my kids all I ask is that I have time to make myself a cup of coffee before the mayhem. Since breakfast is often the most rushed meal of the day, taking a leisurely breakfasts feels a bit like an indulgence.  I’m beginning to think that there are two Christmas cookie camps: there’s the very sweet, sometimes gooey, chocolate-usually-included camp and there is the often spicy, been-around-for-hundreds-of-years, goo-less camp. A simplified view, I know, but the idea of special Christmas cookies covers the gamut. For me, simple is beautiful. I love traditional cookies with complex flavours and pleasing textures, exotic spices and no food colouring. I eat more than my fair share of chocolates over the Holidays and I won’t turn my nose up at gooey sweets but when push comes to shove it’s the unassuming cookie on the tray that catches my eye. Take these Pfeffernusse for example. These German Spice Cookies of my childhood are a humble-seeming biscuit that didn’t really catch my eye until I was in my 20s. I have no German roots but my mom is an adventurous baker and was always drawn to European treats. I grew up eating Saint Lucia buns on December 13, Lebkuchen decorated with candied angelica and Vienna crescents rich with ground nuts. We devoured cardamom gingersnaps, Linzer cookies and pfeffernusse alongside shortbreads and Aunt Mary’s sugar cookies. This isn’t the exact recipe I grew up with though. Since pfeffernusse translates to “peppernuts” I was wondering about the “nut” bit. My recipe has lots of ground pepper but no nuts so I went hunting for other recipes and came across this version, complete with ground almonds, citrus zest and rolled in spiced icing sugar. Slightly chewy and very aromatic these cookies became a new family favourite, especially for my 13-year-old who also has a fondness for Timbits. In a medium bowl whisk together dry ingredients (flour through almonds). In a large bowl beat together the butter and lemon and orange zest. Add the brown sugar in three batches and mix until well combined. Beat in the egg then the molasses. Add the flour mixture in three additions, mixing until just combined. Cover and refrigerate the dough until firm, at least 1 hour. Roll the dough into one inch balls and place on a parchment lined cookie sheet (at least an inch apart). Bake at 350 F for about 12 minutes. (Don’t let the bottoms get too dark). Let them cool a bit then drop warm cookies into the spiced icing sugar and cool on a rack. While the cookies are baking, sift all ingredients together into a large bowl; set aside. To freeze, don’t roll them in the sugar mixture until they’re thawed and ready to eat. Do you have favourite Holiday recipes that you make year after year? I’d love to hear all about them. Do you have any cookie recipes from your childhood that can transport you back in time? This recipe does it for me. The smell of these cardamom scented gingersnaps baking makes me feel like I’m about five years old again and nibbling one takes me back to the kitchen table, a few days after Christmas, drinking hot chocolate out of big red Christmas mugs. The reason why I recall eating them after Christmas is because this is a giant recipe. I always cut it in half but my mom would make the full batch. That’s nine whopping cups of flour. She’d stay up half the night rolling, cutting and baking, and if weren’t for the fact that these are so delicious, she would never have bothered. It’s the cardamom that does it. There is something about the scent of cardamom that makes me think it should have a place in history right alongside gold, frankincense and myrrh. There are no eggs in this recipe and it includes whipped cream. Don’t let that throw you off. The texture of the dough is lovely to work with and the crispiness of the cookie can’t be matched. These cookies are lovely in their simplicity. Use your favourite cookie cutters and cut holes in the cookies before baking if you’d like to hang them on the tree. Beat together butter and molasses. Beat in sugar and spices. With a wooden spoon fold in the whipped cream. Whisk together flour and baking soda then add to creamed mixture in three additions. Refrigerate for at least an hour, or overnight. Scrape dough onto a lightly floured surface, divide in half. On a very lightly floured surface roll to ¼” thickness. Cut into Holiday shapes. Bake on a parchment lined baking sheet for 5-6 minutes. Watch closely. This month’s topic for The Canadian Food Experience Project is all about regional Christmas traditions. Because molasses is such a part of the culinary history of Atlantic Canada, gingerbread cut-out cookies definitely have their place in our Region’s Holiday traditions. If you’re looking for Christmas crafts for kids, painting cookies tops my list. After all, what’s better than an afternoon spent at the kitchen table painting great gobs of tinted frosting onto cut out cookies, applying candy sprinkles with abandon and listening to Christmas records? If you asked my kids they’d tell you that Christmas cookie painting is just about the best Christmas tradition in our house. I grew up painting gingerbread cut out cookies with my brothers and sisters. It was always an afternoon of fun, Christmas music and way too many silver candy balls. Mom would roll, cut and bake dozens of cookie stars, angels, trees, bells and chubby gingerbread men, and as fast as they cooled we’d decorate them, using real paint brushes (reserved for cooking painting only) and varying amounts of skill and patience. My sister Martha was always the most creative. I remember her painting blue denim overalls on stars, complete with contrasting pockets and stitching. Once the frosting hardened (and believe me, it hardened) we’d hang them on the tree where they’re go stale and somehow get more delicious. Is painting gingerbread cookies a New Brunswick tradition? Haven’t a clue but among my family, eating spicy gingerbread cookies under a blanket of tinted frosting is an enduring tradition that helps to define the Holidays. Painting cookies fuels the fire of anticipation with my kids and is the most delightful family activity. Whole wheat gingerbread cut-out cookies. Have on hand your choice of edible sprinkles. Have on hand children’s craft paint brushes with stiff bristles. There are no rules and no limits. Licking paintbrushes is discouraged but won’t get you kicked out of the fun. Wait for the frosting to harden before attempting to hang cookies on the tree. Red and green frosting swirled together makes swampy brown frosting. Don’t swirl if you don’t want brown. “The works” cookies are usually too heavy to hang on the tree. These cookies are for kid consumption only. Aside from the fact that the cookies are usually overloaded with frosting, there is a lot of paint brush licking and fingers in the frosting, so no one but their creators want to be eating them. Is cookie painting a Holiday tradition in your house? Tip: If you want to hang your cookies on the tree, make a hole in the top of the cookie (using a skewer or straw) before baking. When the frosting has dried thread a piece of ribbon through the hole. The Canadian Food Experience Project began June 7 2013. The idea is to share our collective stories through our regional food experiences, to bring global clarity to our Canadian culinary identity. Have you ever spent an afternoon digging through recipe folders and books to find a particular recipe, a family favourite that you make every year? I do it all the time and I swear it’s by sheer luck that I manage to find all of my Holiday recipes every December. 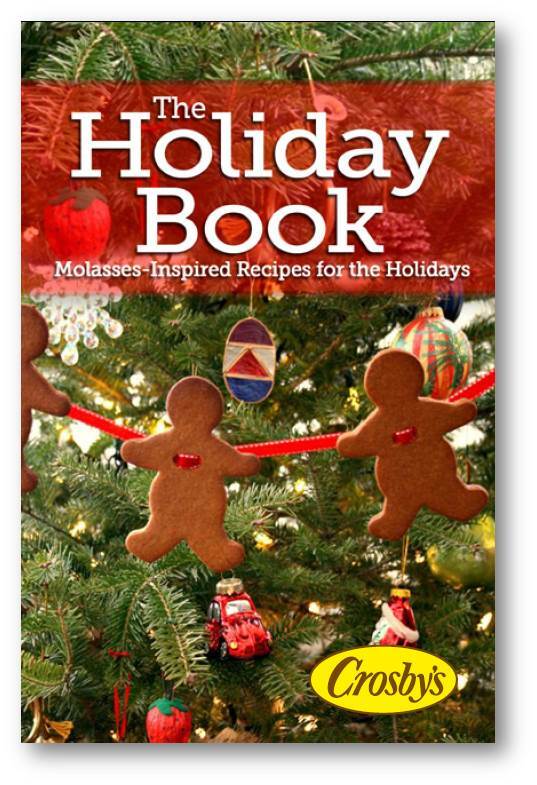 What I have managed to do, however, is gather my favourite festive molasses recipes together in our Holiday Book. This is a collection of 20 seasonal recipes, including classic cookies and bars, homemade gifts and finger food for Holiday entertaining. Originally published last year (e-book only), this year’s version has been updated with new recipes that are just right for the Holidays. This e-book has been created in a simple-to-view format. Just click to open the book, or right-click to print or download the book. No e-reader required. Glossy pecan toffee bars are a Holiday indulgence. A buttery toffee thick with pecans layered on a barely-sweet shortbread base. They’re gorgeous but not over the top. They’re festive and beyond delicious. All that to say: they suit the fun and festivities of the Holiday season in both looks and taste. I can’t believe that I was going to drizzle these bars with melted white chocolate. I would have, but the white chocolate seized in the pan when I was melting it, so was eaten by my kids instead. The toffee-coated pecans are so glossy and pretty on their own who would want to cover them? They are rich and sweet — one iota more of anything might make you forget about the pecans and toffee, and that would be a shame. This recipe is adapted from Ina Garten, the Barefoot Contessa. She dips each square in dark chocolate and if your body can tolerate that extra layer of sweet, then go for it. Beat together the butter and sugar. Mix in the egg and vanilla. Whisk together the flour, baking powder, ginger and salt and stir into the creamed mixture. Stir just until combined. Press into a 9”x13” pan that has been lined with parchment paper. (Ensure that the parchment goes up the sides too). Bake at 350 F for 15 minutes. The base will be set, but this will bake again once the topping is added so don’t worry. Combine butter, brown sugar and molasses in a medium sauce pan over low heat. Stir to combine as the butter melts. Raise the temperature to medium and bring to a boil. Boil for three minutes then remove from heat, stir in the heavy cream and pecans. Combine well with a rubber spatula then carefully pour, scrape and spread over the baked crust. Return to the oven for 30-35 minutes. Are you a fan of pecans? Try our Pecan Pie Bars. They’re crazy delicious. It’s a combination of evergreens and gingerbread that can still make my stomach flutter. It’s a cosy smell that carries with it a lifetime of warm memories and a touch of anticipation. Take away the gingerbread smell and you lose the feeling. A Christmas without snow I can handle but a Christmas without gingerbread cookies? Because everyone has the right to a home that smells like gingerbread cakes and cookies fresh out of the oven we asked blogger and gluten-free baker Jeanine at The Baking Beauties to develop gluten-free versions of our favourite gingerbread recipes for us to share. Love all sorts of Gingerbread cut out cookies? Try our chocolate gingerbread cookies or our whole wheat gingerbread cookies. Both recipes are perfect for cutting into shapes and decorating. (They’re not gluten free). Baking gingerbread cookies is the most enduring tradition in my household. I grew up baking cut out cookies with my mom and then we’d paint them with a simple milk and icing sugar frosting. My brothers, sisters and I would spend half a day at the kitchen table with bowls of tinted frosting, red and green sprinkles and little silver balls, decorating dozens of cookies and listening to Roger Whittaker’s Christmas album. To this day the song Darcy the Dragon takes me back to the kitchen table in the house where I grew up. I still love painting Christmas cookies and my kids consider it a sacred Holiday tradition so there is at least one day before Christmas when we all sit down to an afternoon of painting, usually with a few friends. My kids are masters of the one-tonne cookie, a cookie that is so loaded with icing and sprinkles that you need a spatula to lift it off the table and onto a plate to dry. For me it’s digging out the cookie cutters, and having my kids by my side at the counter as we roll, press and lift the cut-outs onto the cookie sheet. It’s the sweet and spicy smell of the house when the cookies are in the oven and the giggles in the kitchen as we paint and sprinkle away. This chocolate gingerbread recipe is a new take on gingerbread cut-out cookies. They have an intense chocolaty flavour but aren’t overly sweet, making them perfect for decorating and sandwiching. The dough is soft and barely needs flour for rolling. If you want the cookies to be harder just bake them a little longer. In a medium bowl whisk the flour with the cocoa, ginger, cinnamon, cloves, baking soda, baking powder and salt. In a large bowl beat the softened butter with the brown sugar until fluffy. Beat in the egg, then molasses, then melted chocolate. Add the flour mixture in three batches, incorporating well between additions. Scrape dough from bowl and divide into three equal pieces. Pat each piece into a disk, wrap in plastic and refrigerate until chilled. Place cut-out cookies on a parchment-lined baking sheet. Bake at 350 F for about 7 minutes. It’s gingerbread season, as good a reason as any to celebrate chilly weather. Not that I’m celebrating…I always have trouble adjusting to the November cold. In the meantime, I fend off the chill with warm and spicy baking. Gingerbread in all shapes and sizes is my favourite — It reminds me that there is much to love about November and the Holiday anticipation it brings. Comforting gingerbread is a welcome treat in our house and we have more than enough recipes to fill a book. 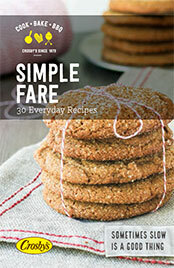 In fact, we have updated our Gingerbread e-book with a year’s worth of gingerbread recipes from our recipe blog. This new version includes 18 recipes for gingerbread cakes and bars plus sweet toppings to dress them up. Get all the gingerbread recipes you crave in this new, free e-book. Just click to view and download. No e-reader required. I wasn’t intending to write a post today but I can’t resist sharing this recipe that molasses fan Emily sent me yesterday. It’s for chewy chocolate gingerbread cookies, from the Queen of Cookies herself, Martha Stewart. I was down to the wire yesterday putting teacher gifts together when this recipe landed in my inbox. I didn’t get a chance to mix them up until late last night so I cut some corners in the method. (Chill dough for 2 hours? Nix. Form into balls and refrigerate for 20 minutes? Nix). It was 10:00 pm when the flour hit the bowl so as soon as everything was combined they went in the oven. I even managed to stay awake long enough to dip them in melted chocolate. In another bowl beat butter and grated ginger. In a small bowl, dissolve baking soda in 1 1/2 teaspoons boiling water. Beat half of flour mixture into butter mixture. Beat in baking-soda mixture, then remaining half of flour mixture. Roll dough into 1 1/2- inch balls; roll in granulated sugar. Bake at 325 F until the surfaces crack slightly, 10 to 12 minutes. Cool and dip in melted chocolate. I have never been much of a candy maker but I love the look of shiny brittle so figured that it’s worth making once a year. And as far as homemade gifts go it’s pretty spectacular. Glossy and filled to the brim with good stuff, Cranberry Walnut Brittle lets you have the delicious and the nutritious in one sweet bite. Feel free to mix in your favourite nuts and seeds. I found the original recipe on the food blog Adventures in Cooking. They made it with honey, which I’m sure is delicious too but there is something about molasses that smells and tasts of holiday celebrations and special times spent with family and friends. In a large pot combine the sugars, molasses, water and salt. Bring to a gentle boil over low to medium heat, stirring from time to time. Using a candy thermometer heat the mixture to 302 F. (On my stove this took close to an hour). While the sugar mixture is boiling, place a sheet of parchment paper on a baking pan. Lightly grease the parchment paper. When the sugar mixture reaches 286 F, quickly remove from heat, stir in the butter and nuts and turn out onto the prepared pan. Use a rubber spatula to spread as thinly, and evenly as possible. The mixture will start to seize up immediately so you’ll have to work fast! For more Holiday gift ideas check out our Holiday Book, a free e-book full of our favourite Holiday recieps. This candy is chock full of good stuff! I’m a sucker for spiced nuts. Ever since my sister started making these years ago I have been eating more than my fair share over the holidays. They’re sweet, a little spicy and crispy with a light candy coating. They don’t stick in your teeth. I make them to give as gifts but always make extra so there are left overs for use to nibble. They’re a practical snack to have around the house, store well and have a whiff of healthiness about them. Better yet, they take almost no time to prepare. Find this recipe and more in our little Holiday e-book. Here’s a tip: If Chinese Five Spice powder isn’t your thing try chili powder or your favourite spice blend. And mix up the nuts too. Sometimes I make these just with almonds, or walnuts and sometimes I mix the two and throw in a few pecans. In a large saucepan or wok, melt butter. Add sugar, molasses, water, salt and spices. Stir until sugar dissolves. Add nuts to the mixture and cook until syrup thickly coats nuts, stirring frequently (5 minutes or so). Transfer to a parchment lined baking sheet. Bake at 350 F until nuts are lightly toasted and a little crisp (10-15 minutes). Test while baking to ensure you don’t overcook the nuts and the syrup doesn’t burn. Nuts about nuts? Try Gingerbread spiced almonds. What are your favourite homemade gifts to give (or receive)? Biscotti seem like the ideal cookies to give as a gift. Aside from the fact that they’re beautiful, they’re good and sturdy, remain great for dunking even when they have been around for a while and they aren’t overly sweet so are satisfying in a biscuit sort of way. Plus they’re impressive and that’s a nice touch in a homemade gift. Don’t let the fact that you bake them three times scare you off. The dough is quick to mix up and the baking steps are simple. I find that biscotti are especially pretty when you leave the nuts in larger pieces. The problem I have though is that they crumble on me when I slice them. That’s why I whirr the nuts into smaller pieces in the food processor. But if you’re good with a knife (and have really sharp knives) you’ll have no trouble at all slicing through the larger chunks of nuts. In a food processor, whir ½ cup of the rolled oats until finely ground. In a large bowl combine the ground oats with the remaining ½ cup of rolled oats, the flour, sugar, salt, baking powder, baking soda and spices. In another bowl whisk the eggs, molasses, oil and vanilla until well combined. Gradually add the dry ingredients to the wet ingredients and mix until well blended. Add the hazelnuts and dried cranberries. Divide dough in half and on a lightly floured surface roll each half into a 12” log. Transfer logs to a parchment lined baking sheet and bake at 350 F for 30 minutes, until golden and firm to the touch. Remove from the oven and let cool for 10 minutes. Reduce oven temperature to 300 F.
Carefully move logs to a cutting board and cut into ¾ “slices on the diagonal. Place the slices back on the baking sheet, cut side down. Bake for 6-8 minutes, flip the slices and bake another 6-8 minutes. The dough will look very pretty, studded with chopped nuts and dried cranberries. Roll the dough into logs and space them about this far apart. Flatten them a bit more if you want a longer biscotti. Once they have baked the first time, slice them on the diagnal, very carefully. If you want a longer biscotti, slice them on more of an angle. Once they’re sliced, lay them face up on the cookie sheet and bake again. Flip over and bake for the final time. When cooled, drizzel them with white chocolate or a simple glaze. I love giving delicious gifts. And I like practical gifts too, the sort of thing that’s not going to get tucked in a closet and forgotten about. That’s where homemade edible gifts come in handy. With all of the bustling of the holidays and friends popping over, it’s great to have a sweet treat that’s easy to pull together in a snap. I’ll fess up — I don’t have great stamina for shopping so it’s easy for me to fall back on homemade gifts. I’d much rather spend the day in the kitchen than the mall, especially when I have cookies like these in the oven. Scented with holiday spices and oprange zest, your house will smell festive and delicious when these orange spice molasses cookies are baking. If you’re giving a jar of these cookies as a gift, don’t forget to include the full recipe with the instructions. Place brown sugar in 1-quart jar and pack down firmly and evenly. In medium bowl, combine flour with baking soda, orange peel, cinnamon, ginger, cloves and allspice. Spoon flour mixture over brown sugar, pressing down with each addition. Place cranberries over flour mixture and press down to fit all in jar. Place lid on jar to close. Add egg, butter, molasses and vanilla. Beat on low speed or by hand until dough is thoroughly blended. Drop by rounded teaspoonful onto parchment lined cookie sheet. Bake for 7 to 9 minutes or until set. Gingerbread spiced nuts, molasses shortbread, festive gingerbread cut out cookies. All of these recipes are in one place in our new Holiday cookbook that you can download for free! And their simplicity stands out amidst all of the over-the-top cookies and squares that are popular at cookie swaps. They may not look as snazzy as say, triple layer marshmallow snicker-doodle squares, but they are distinct in their own quiet way. Preheat oven to 325. Combine flour, powdered sugar, and spices in a large bowl. With a fork or your hands mix in the molasses. Knead until mixture forms a ball and divide in half.